Jupiter (Guru) transit from Virgo to Libra Zodiac Sign 2017 prediction (Guru peyarchi palangal 2017 palangal) for Aries (Mesha) Rashi as per Thirukanitha Panchangam . Jupiter (Guru) transit to Libra sign (Tula Rashi) would happen on September 2nd, 2017 and stay there until October 4th, 2018. The year 2017 is very important in planetary transition. Three important planetary transit (Saturn transit, Rahu Ketu transit, and Guru Peyarchi) happening in the year 2017. Let us analyze 2017 and 2018 Jupiter Transit from Virgo (Kanya Rashi) to Libra (Tula Rashi) (Guru Gochar in 2017 and 2018) in detail for each Rashi, so we can know what to expect. The Aries is the first Rasi in the Zodiac, according to the ancient astrological texts. The Nakshatras or stars Ashwini, Bharani and Karthigai (1st Pada only) come under this moon sign. Those born under any of these stars will come under the Aries moon sign. Full of fire and courage, you never stop at obstacles. You fight and overcome them with grit and mental strength. The Aries constellation is ruled by the fiery planet Mars. The current ruler Lord Jupiter is a presenter of both good and bad. Still, He is the one who can give the most benefits to your moon sign. The planet Jupiter had transited to its friendly House Virgo from August 2nd, 2016. The transit last year might have caused mostly troubles for you. Students would have faced problems in studying; even those who worked hard would have had trouble scoring desired marks. You would have been depressed about this. Your friends might have turned against you. Due to your forgetfulness, you would have lost many valuables and even give way to thievery in your property. Those in jobs and businesses would have faced losses and unaccountable delays and failures in everything. Your promotion and salary hike would have been delayed. A few of you would have suffered from accidents, while others had got entangled in court cases, disputes and quarrels. Thus, the news of Guru Gochar 2017 and 2018 (Guru payarchi 2017 and 2018) will be welcome news to you. But do remember that Lord Jupiter alone is not the cause of all this mischief; it is the presence of the Lord Saturn in your Eighth House. The transit of Lord Jupiter this year (2017) will take you towards the path of success and happiness. The transit of Jupiter to your 7th House is a very good occurrence for you. The 7th House is the House of Relations. Hence those suffering from conflicts with your spouses, lovers will have a joyful reunion. Those awaiting marriage will have their dreams come true. Your family will have reasons to rejoice. Also, the aspects of Lord Jupiter falls on your House of Profit (Aquarius), which is the Fifth House for Him. This will ring in profits and success down your line. The 11th House is the House of elder brothers and sisters. This indicates that they will be successful in all undertaking of life like marriage, progeny, academics, and career. 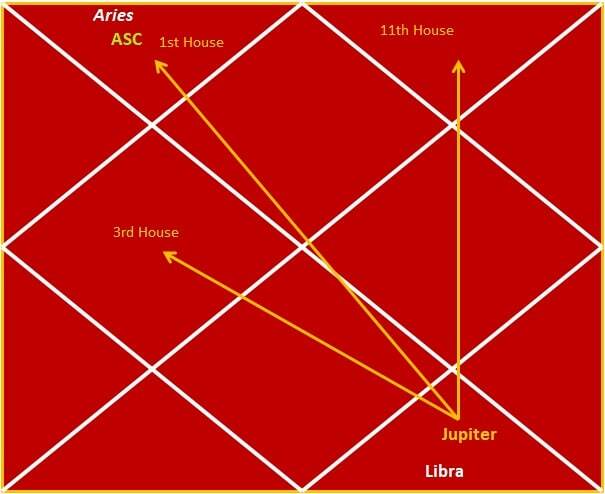 Lord Jupiter’s aspects the 7th House with His gaze, which is Aries (Mesha Rashi) itself, your moon sign. The moon sign reflects your mental well-being and physical health. The physical ailments that have been troubling you till now will vanish. Your confusions and anxious thoughts will give way to a calmer, clearer you. Your thoughts will lead you to success. Jupiter aspects the 9th House (which is the House of Gemini) with His gaze. The House of Gemini is your 3rd House, which indicates your courage and also younger siblings. Your difficulties will melt away and you will face success in whichever work you undertake. Your younger siblings will also be successful in all areas of their life like academics, work, and private life. Let us look at the general predictions on the effects of this transition for everyone. Students will achieve great scores and pass out with flying colors. They will get whatever course or college they have worked hard for. Those in business, trade, and employment will see their luck turning its tide. Promotions, salary hikes, profits, and praise will start coming your way. Husband wife relationships will be on the mend. Childless couples will be blessed with children. Marriages will start taking place. The money you had lent earlier will come back to you. Any loans you have taken will be paid off.